Moreover, it’s impossible to predict the exact duration of the project. These kinds of expeditions are highly unpredictable. We may encounter some difficulties that would make it hard or even impossible for us to continue our journey. Bureaucratic, political, health or personal issues may arise and it could happen after a week, a month or a year. The truth be told, our project represents a big logistic challenge, therefore it’s impossible to predict whether we will make it/how far we will make it (fingers crossed! 🙂 ). After all, we will put our safety and well-being first – we owe it to each other, to our family and friends. We are planning to visit all 196 sovereign countries (193 UN countries + Taiwan, the State of Vatican City, and Kosovo). Full disclosure: tourism is hardly sustainable. The best thing any of us can do for the environment is to stay at home, to walk to work, and to minimize our electricity/water consumption – that is a fact. It’s also a fact that we are doing our best to protect the environment (even and especially in our free time) and that we love to travel. It’s a common paradox. We are well aware of it, but we cannot help it. Tourism is first and foremost an industry and as such it has a negative impact on the environment. However, we can still do our best to make it more sustainable. As far as carbon footprint is concerned, our project will have a negative impact on the environment. It would be way better to travel by foot or by bicycles, which is, since we wish to travel to all sovereign countries, sadly impossible. Our carbon footprint will be big, but we will try to offset it by planting the required number of trees. To make our project more environmentally friendly, we will try to do 10-minute clean-ups wherever and whenever possible, we will encourage local authorities to start recycling, we will not eat beef, lamb or pork (since animal agriculture has a negative impact on the environment), and we will try to set an example by minimizing waste, using eco-friendly products, and by choosing sustainable accommodation wherever possible. To sum up, we will do our best to make our environmentally unfriendly trip as sustainable as possible and we promise to make up for any damage our project may cause in spite of our efforts. 5. How will we be able to afford it? We will cover a part of the expenses with the money we have saved in the past five years, the other part will be covered by our sponsors. Now, about that… Crowdfunding travels is an ancient practice. Countless explorers crowdfunded their travels, including Christopher Columbus. Today, in a slightly different way, getting paid for traveling is thriving more than ever. Nowadays, countless companies invest their money in online promotion. They hire influencers to promote their products on social media. It’s a common practice, which can be very profitable for the influencers as well as the companies, whose products they promote. Since we want to stay true to ourselves, we only wish to collaborate with companies/brands with similar interests, and we will make sure to only write honest opinions and reviews. If you are interested in collaboration, you can find out more here. Our past adventures have completely changed our lives. We became much more aware of the beauty our planet has to offer as well as of the problems it faces. An uncontrollable desire to see and help the world was born. 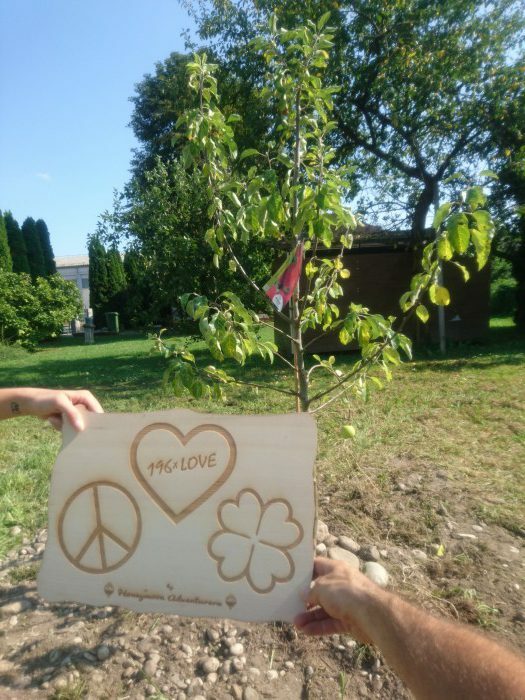 We came up with a project that can do both – 196xLOVE enables us to travel the world and to promote peace (which can also be defined as love for people), sustainability (aka. love for nature), and love in any other form. With visual content from all across the globe, we will try to prove that love is, in fact, everywhere and everything. We will not promote these concepts just for the sake of it. We actually believe in them and we will always strive to give them as much attention as possible. On the long run, our goal is to create an online business, which will enable us to work from wherever and give us enough free time, which we would invest in environmental and charitable activities as well as in other travel adventures. 9. Why do we want to visit all sovereign countries? The simple truth is that we love to travel. Travel broadens horizons, breaks stereotypes, and changes lives. The thing we appreciate the most while traveling is diversity. And it’s definitely easier to find diversity in 196 countries than in one single country (although we do come from an unusually diverse European country 😉 ).